Hello Kitty Turns 40 And Reveals "I'M NOT A CAT!" Hello Kitty Turns 40 And Reveals “I’M NOT A CAT!” They say turning 40 can sometimes provoke a mid-life crisis – Welcome to 40 Hello Kitty! 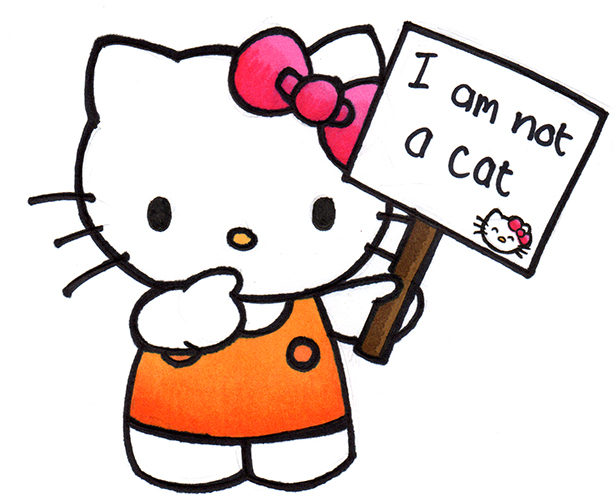 Apparently Hello Kitty has revealed that she is not, never has been, and never will be, a cat. Her creators, Sanrio the Japanese company that owns and manages the Hello Kitty brand, announced this at her birthday celebration. the Los Angeles times spoke with Christine Yano, an anthropologist from the University of Hawaii who has spent years studying the phenomenon that is Hello Kitty. (who does that?? :/) Anyhow, while Yano was preparing written texts for the Hello Kitty’s 40th anniversary, she described Hello Kitty as a cat. She was firmly corrected by Sanro. “Hello Kitty is not a cat. She is a cartoon character. She is a little girl. She is a friend. But she is not a cat. She’s never depicted on all fours. She walks and sits like a two legged creature. She does have a pet cat of her own, however, and it’s called Charming Kitty,” said Yano. It has been reported by the Los Angeles times that Hello Kitty’s real name is actually Kitty White. She is the daughter of Mary White and George White, and she has a twin sister named Mimmy. Hello Kitty will be celebrating her 40th anniversary party at the Japanese American National Museum starting in October. Maybe this is information you could have definitely lived without, but now you know! CLICK HERE —> TO LIKE DAILY BUZZ LIVE ON FACEBOOK! Her Dad Refuses To Walk Her Down The Isle At Her Wedding, BUT It’s Okay, WAIT Until You See Why!